As the wicked king Kamsa and his allies do the misdeeds towards the Dharma, torture the good people and stopped the devotees of Sri Maha Vishnu, the retinue of Indra, Saptarshis (The seven sages) and other angels request Lord Sri Maha Vishnu to save them from the wicked ones. Lord Vishnu gives them the assurance of saving them from the wicked demons by incarnating himself in as the eighth son of Devaki and Vasudeva. And will be called with the name Krishna. As Kamsa learned about the pledge of Lord Vishnu, he wants to kill the will born infants of Vasudeva and Devaki. Thus he captures the couple and kills all the seven infants as they just born. With the miracle of Lord Vishnu, all the guards fall deep asleep when Devaki gives birth to the her eighth child. Vasudeva brings the child to Reppalle, the village which is at the other side of the river Yamuna. As he crosses the river, the five headed snake acts as umbrella to protect the infant (Lord Krishna) from the rain. Vasudeva successfully and hideously replaces Krishna with the baby infant (Yoga Maya) of Yasodha, wife of the clan leader Nanda. Kamsa thinks that the baby infant is the eighth child of Devaki and tries to kill the infant but fails at the miracle that the infant turns into a lightening Yoga Maya and warns him of the growing child elsewhere to kill Kamsa. Dejected by the news that his death is being nurtured as a child, Kamsa orders to kill all the infants in the kingdom, and sends many demons to find Krishna. 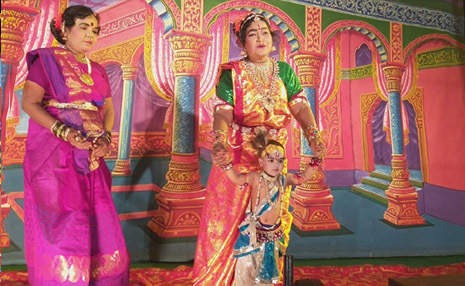 Krishna (the lord himself), grows as a kid in Repalle. With many miracles, Krishna kills all the demons those come to kill him. And he gives a variety experience of joy to the villagers with his deeds. The people of Repalle feel the greatness of the kid and feel the happiness in his presence. As Krishna grows, Kamsa invites Krishna and his brother Balarama to the Dhanuryaga (ceremony of a great bow) and wants to kill Krishna in the ceremony. But finally Krishna kills Kamsa and frees his parents and other prisoned people thus to establish Dharma (righteousness).